There was speculation that Final Fantasy Versus XIII would appear at Sony's PS4 reveal. Shinji Hashimoto, Versus' producer, arrived on stage. Surely, this was the moment. But it wasn't. It wasn't at all. Hashimoto, who is also the Final Fantasy brand manager, announced that Square Enix was making a new Final Fantasy. Square Enix, which makes Final Fantasy games, is making a Final Fantasy? Of course it is! A new Final Fantasy is nice and all, but what about Final Fantasy Versus XIII? You know, the game that was announced as a PS3 exclusive. That game is obviously running out of time. "I would also like to announce that we are preparing for development of a Final Fantasy title," Hashimoto said, after Square Enix once again showed its Luminous Studio tech demo. Preparing for development? Bwah? Online, some don't exactly seem optimistic about Final Fantasy Versus XIII. Others are keeping the dream alive. "They never said it would be here... or that it has been canceled... nor did they say it would be at E3," wrote PostDisaster over on GameFAQs. "However there is Noctis perfume. If anything that should give us hope this game still exists." After all these years, it's hard to keep up hope. "I'm not THAT upset about it," wrote Dethgaze66, in a thread titled "Trying to stay positive". Continuing, Dethgaze66 added, "I have a life outside of waiting for this game. It's just a bit depressing that this was announced when I was in 6th grade, I'm out of high school now." Others are saying they think Versus has been canned. 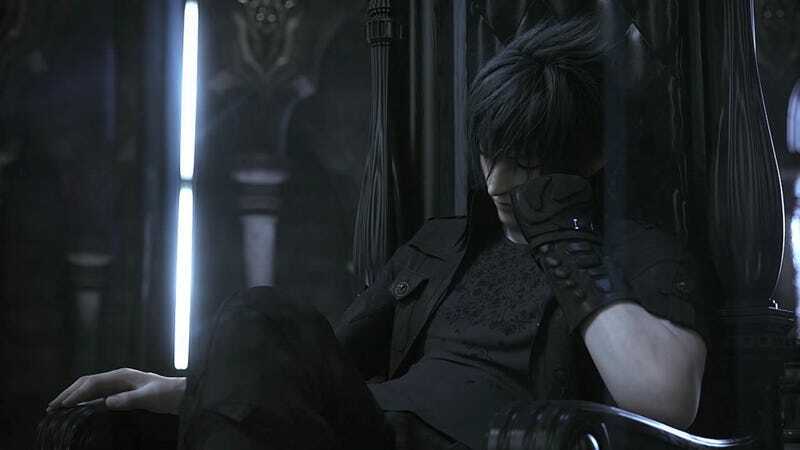 Last year, Kotaku ran a rumor that Final Fantasy Versus XIII had been cancelled and possibly folded into the next numeric Final Fantasy. Square Enix honcho Yoichi Wada publicly denied this. Later, Wada said Versus won't be shown until Square Enix feels it embodies Final Fantasy. "PS3 console gen is now essentially coming to an end, and still no sign of this game. I am reserving my judgment for E3," wrote ZeroGravity347. "If this 'PS4 FF' game doesn't turn out to be Versus, then I am giving up completely. The excuses will keep on coming. Lightning Returns will be released, FF14 will be released, and they will still manage to come up with excuses on why Versus is not getting any information." There's always this E3. And then, whatever comes after that.